Once you’ve decided to take a Walt Disney World Vacation you have a myriad of resorts to choose from. Even if you know that you want to stay “on property” the style and theme of the hotels offered ranges from a cartoon like value rooms at the Pop Century to the Walt Disney World Resort’s Flagship Hotel the Grand Floridian Resort & Spa. How one chooses where to stay from the many available options is a highly personal choice, with every fan having their favorite. For myself, picking a resort is about two things, amenities and location, location, location. For guests that want a premium experience with quick, convenient access to both the Magic Kingdom, Epcot, and other Resorts; I suggest you stay ‘on the monorail’. Staying on the monorail means that you’re hotel will be one of the three Deluxe Resorts located around the shores of the Seven Seas Lagoon. The main loop of this very special public transit system system was part of the original WDW design and opened with Walt Disney World Resort in 1971. It encircles the lagoon and initially featured four stations: the Transportation and Ticket Center, Disney’s Polynesian Resort, the Magic Kingdom and Disney’s Contemporary Resort. 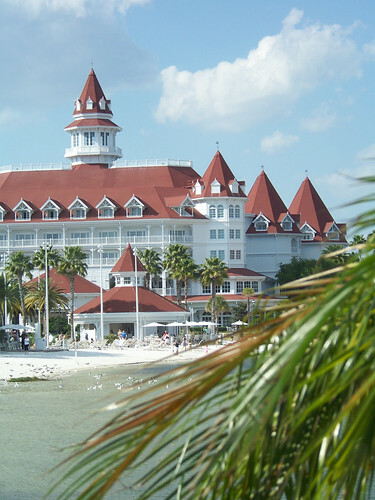 When the Grand Floridian Resort and Spa opened, it added a fifth stop, and additional resort on this loop. These Deluxe Resorts offer all of the amenities of a full service hotel, with the legendary Disney service. In addition the Contemporary Resort, Polynesian resort and Grand Floridian Resort and Spa all offer full service marinas, enchanting pools, and top notch dining. Most of these guest rooms can accommodate five people with relative ease, making them ideal for families that want to spread out a bit. You’ll pay a little more for a room right in the heart of the action, but for some the experience is completely worth it. The best part, it’s all just a short monorail ride away; making the trip back to the hotel for naps, an afternoon swim, and changing for dinner more accessible than ever. Across the Seven Seas lagoon you’ll see Cinderella Castle’s towering spires rising to the sky in the Magic Kingdom, also just a short monorail ride away. There’s little more magical to me than walking back to your room at night and seeing the Castle lit up in all of it’s majesty. For those who are looking for a special location to enjoy their Walt Disney World Vacation, I suggest that they try one of the magical resorts on the monorail line. Their service and style are spectacular, and you just can’t beat the location. This entry was posted on Saturday, December 24th, 2011 at 2:57 pm	and is filed under Hotels, Planning. You can follow any responses to this entry through the RSS 2.0 feed. You can leave a response, or trackback from your own site.